Wimbledon’s marathon man John Isner has finally made it deep into the tournament – and he does not want to stop now. Isner’s will always be synonymous with the 11-hour match he played in 2010 against Nicolas Mahut. But, while he came out on top in that one – and has a plaque on Court 18 to prove it – his overall history at the All England Club has not been a happy one. In the seven years between 2010 and this tournament he won just nine matches, never making it past the third round. But now Isner is through to the Wimbledon quarter-finals for the first time, and just the second time at any grand slam, where he will take on 13th seed Milos Raonic. Isner said: “Certainly this tournament since that long match has sort of been a house of horrors for me. I’ve lost a lot of very, very close ones, third round especially. “There was certainly some doubt. When you have left this tournament the last nine, 10 years pretty disappointed with my result, gone home sort of hanging my head a little bit. But it’s not the case this year. Rallies are likely to be at a premium today when two of the biggest servers in the game meet. Isner tops the standings for aces with 135, 18 ahead of Raonic in second place. Isner has landed an impressive 77 per cent of his first serves, so it is no surprise he is one of only two players, alongside Roger Federer, yet to have his serve broken. After recovering from 18 months of injury problems, Raonic appears to be hitting top form again and gave Federer a good test on grass in the Stuttgart final last month. Federer’s Centre Court residency at Wimbledon will come to an end today. 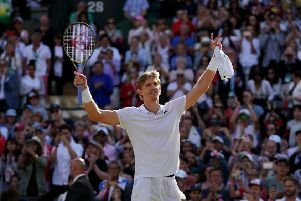 The eight-time champion played all seven of his matches last year on the main stadium court and was also a fixture there for his first four contests of this fortnight’s championships. However, Federer’s quarter-final against South African Kevin Anderson has been allocated a Court One slot. It will open play at 1pm followed by the battle between Raonic and Isner. Centre Court action begins with Novak Djokovic taking on Kei Nishikori, followed by Rafael Nadal’s match against Juan Martin del Potro.